Discover something new in your city! The National Maritime Museum. Aside from exposing you to new ideas, people and places, one of the best things about travel is that it opens your eyes to the attractions of your own town. Case in point - I pass the National Maritime Museum at Place du Trocadero a couple of times a week and have never had the slightest inclination to go inside the uninspiring building because views of the Eiffel Tower or thoughts of an afternoon treat at Café Carette always seem more enticing. Even the colorful signs for the current exhibition, "PHARES" ("Lighthouses") weren't enough to lure me across the threshold. All of that changed during our recent trip to Martha's Vineyard when I learned that Paris was the lighthouse capitol of the world in the 19th century. 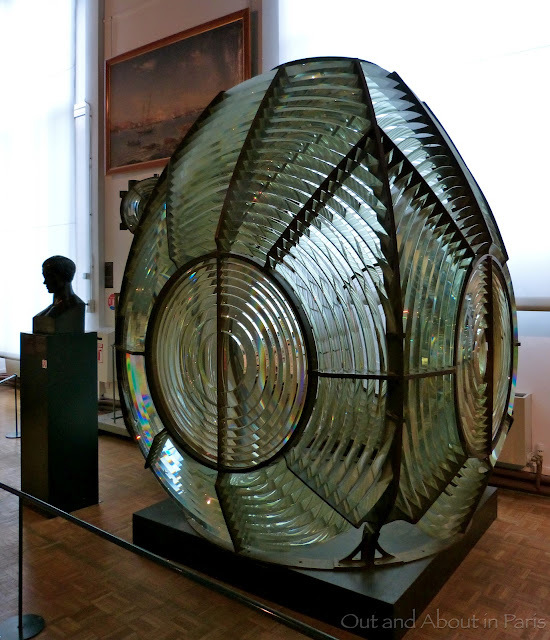 Suddenly, I wanted to know more about the Fresnel lens, the French invention that has guided ships safely past the treacherous rocks lining the shores of Massachusetts since the mid 1800s. And what better place to start my research than the National Maritime Museum! Known as the "King of Lighthouses and the Lighthouse of Kings", Cordouan is the oldest lighthouse in France. Construction started in 1584 and it was lit for the first time in 1611. Under the direction of King Louis XIV's Finance Minister, Jean-Baptiste Colbert, an opulent King's Apartment was created on the second floor of the lighthouse. For this reason, the lighthouse is also known as "the Versailles of the Sea". Crossing the Channel, the section on English lighthouses featured documents from Trinity House, the General Lighthouse Authority for England, Wales and other British territorial waters that was granted a royal charter by Henry VIII in 1514. In order to maintain its lighthouses, the corporation charges "light dues", a toll levied on ships proportional to their tonnage. The Arc de Triomphe was used as a platform to test the first system of Fresnel lenses on September 7, 1821. The light was seen 26 kilometres away. With sections on Cordouan Lighthouse, Fresnel lenses, the history of lighthouses in Paris, the architecture of lighthouses, the responsibilities of a lighthouse keeper, maritime security, the authors who were inspired by lighthouses and interactive games for children, this exhibition is a "must-see" for anyone interested in lighthouses. After making the mistake of going without my husband, I'll be returning with Stephane in the very near future. Good to know: Be sure to get a free audio guide because all of the signage in the exhibition is in French. I was able to take a photo of this first order Fresnel lens because it's part of the permanent exhibition at the National Maritime Museum. "Lighthouses of France". Be sure to allow enough time to visit the giftshop because there are some interesting items. I owe you a coupe de champagne, Gwan! Did you use your super sleuth research skills or have you been to Verzenay? We haven't heard back from Ruinart (left it too late!) but are going to Tattinger, Moet & Chandon, a small producer and maybe Pommery or Veuve Clicquot. I haven't reserved the last two yet because I'm not sure how many champagne tours Stephane will do! Please let me know if your have any suggestions for our weekend. I heard that there's supposed to be a champagne bar in the trees that sounds intriguing, in a wild and swinging way! We'll have to organize a get-together soon so that I can treat you to a glass of bubbly! Yusss! Never give me a challenge where I can Google, *I* am never wrong, ha ha! ;) I am always motivated for a catch-up even without champagne incentives, but let's say it doesn't hurt! PS Sorry for not "liking" you on Facebook, being a Google Queen I am very vigilant about the ways in which information can be put together to find out a lot about a person - even with just a first name and a few key details you can certainly find me in google. NOT that anyone would be bothered, but you never know! I am liking you in my heart though and I'll try to remember to check in, because I loved all of your photos! No need to apologize, Gwan! It took me ages to get Facebook for many of the exact same reasons that you mention. You're wise to be cautious. What a great exhibit! I've always loved lighthouses and would love to stay in one. I know there are such opportunities out there, I've never pursued it but maybe I should. And I love that poster. And you're going to Deauville. You owe me a glass. oh, any idea who the trinity is in the pediment of the museum's entrance? Come to think of it, I should look into staying in a lighthouse in France! Thanks, Joseph. It's not something that I would have thought of on my own. Plus, I'm sure that it would really appeal to Stephane as well. While you're absolutely correct that I'm going to Deauville...I'm not going until Sept 8 & 9. This weekend we're going to visit a small champagne producer in Verzenay, where there's a lighthouse in the vineyards. Sorry, I don't know anything about the trinity. I'll have to see if I can get a better photo of the writing underneath them the next time that I'm at Trocadero. Just in case Gwan and Joseph are wrong, I'm guessing Reims. @Planejane, Very, very close! We are going to Reims but the lighthouse is in Verzenay. After reading Joseph's comments, I think that he owes you a glass of champagne! There's a good chance that you may even be in Paris at the same time. 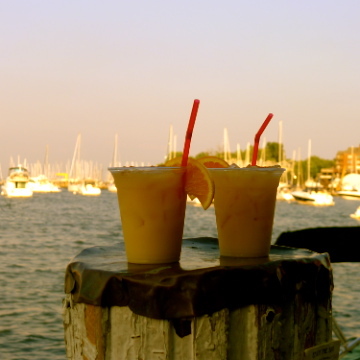 When is your next visit? Since it is on the list for the "Paris Museum Pass" it is now on the list of maybe during our 6 day Museum blitz. It's definitely worth it if you're at all interested in the history of lighthouses and their construction! And the added bonus is that you'll be able to read all of the information signs since they're in French. Just don't make the same mistake as I did and think that the exhibition is only in the first two rooms. Follow the "sens de la visite" sign that takes you to a funny little passage that opens into a larger space. Be sure to plan enough time to visit the permanent exhibitions as well! For those interested in staying at a real lighthouse, I recommend they consider The Keeper's House on Isle au Haut, Maine. You'll find there are a number of outstanding accommodation options there. I stayed there years ago with some friends and had an outstanding experience hiking and kayaking the island, as well as just watching the amazing fog come and go across the water. And the food prepared there daily is gourmet quality! It's my favorite novel in which the lead character is female. On this basis, I recommended it to both my sisters; both of whom loved it, too.